Another reason to celebrate: after years of calls for the removal of certain eligibility criteria for treatment (people need to have liver damage before they are able to access coverage, contrary to medical guidelines), the Ontario government has made it easier for people to get treated. While restrictions remain, many more are now able to access these life-saving medications and the process for prescribing them is much easier. Our program recently published a study in the International Journal of Drug Policy demonstrating that our clients were able to successfully adhere to medications and achieve cure, all while continuing to use substances. This contributes to a growing body of research that proves what we knew all along: that people who use drugs can successfully be cured of hepatitis C when offered adequate supports and non-judgmental care. This group has historically been excluded from treatment because of discrimination from some health-care providers – our program was created to address this gap and has been treating people who use drugs for over a decade. In Canada, the group that carries the heaviest burden of hepatitis C is people who inject drugs: 42.6 per cent of all hepatitis C cases in Canada are among current and former injection drug users, and 66 per cent of people who currently inject drugs have been infected with the hepatitis C virus. If we are to meet the World Health’s Organization targets of hepatitis C elimination as a major public health threat by 2030, we need to collectively be supporting and treating those who are most affected. With these recent successes, we should be breathing sighs of relief that more of our clients can be cured of hepatitis C. And to a certain extent, we are. However, the battle to save lives and prevent illness and death from hepatitis C has now been sidelined by the overdose crisis. Note: it is an “overdose crisis” and not an “opioid crisis” as it is frequently mislabeled. It is a crisis because people are dying, and they are dying of overdose − not because they use opioids, but because they do not have access to a safe supply of opioids, where they know what they are consuming. Since the current crisis started accelerating overdose deaths in Canada, we have found ourselves curing people of hepatitis C, only to find ourselves grieving their loss to overdose months after celebrating their cure. We have lost many clients from across our program over the last year, and our surviving clients have lost friends, family members and loved ones. We have lost colleagues including heroes from the harm reduction community. And we do not anticipate that this crisis will end anytime soon. We are distributing naloxone to drug users and their friends and family, but while naloxone is a life-saving antidote to opioid overdose, it does not prevent the overdoses themselves, nor the traumatic experience of witnessing and responding to overdose. Last month, the Public Health Agency of Canada released that an estimated 2,458 people died of opioid overdoses in 2016. We need creative, bold and responsive solutions to this situation. National organizations like the Canadian Association of People who Use Drugs (CAPUD) and the Canadian HIV/AIDS Legal Network have called for actions that, if taken, could dramatically change the course of the overdose crisis,including ending the War on Drugs. And so, this year for World Hepatitis Day we continue to educate, gather together, and remember. Yesterday we held an event where we displayed art by members of our program – many of whom are now cured of hepatitis C. We continue to celebrate each and every person who, through their hard work and dedication, achieves a cure. But we do so with heavy hearts, filled with grief and rage at the ongoing losses to overdose and the additional deaths that are sure to come. Annika Ollner is a Program Coordinator with the Toronto Community Hep C Program, at the Sherbourne Health Centre site. Very important information being left out Ontario overdose protocols. 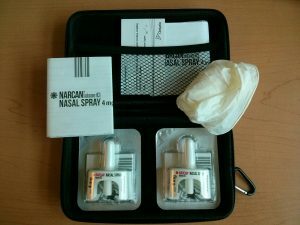 Rescue breathing is first line defense Naloxone is second line defense. My letter ‘Flaws in Toronto’s Opioid Overdose Prevention Program’ EMN 2015; 37(12):31 With hyperlinks to Public Health Ontario’s training literature, and also the proper protocol. Your pet eats a poison or drug Veterinarian will give respiratory assist and any antidote, not torture them with chest compression’s only. Why would we allow this to our women and children?